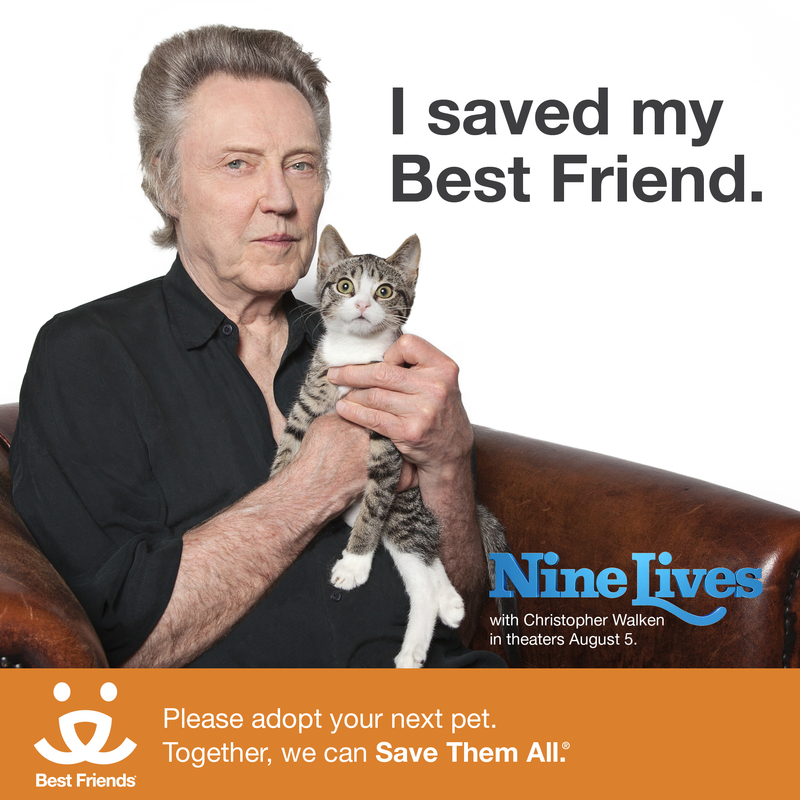 One of the most noteworthy and versatile actors, Christopher Walken supports Best Friends Animal Society’s efforts to bring awareness to the plight of millions of cats who die in our nation’s shelters every year. Walken earned worldwide acclaim and the Academy Award for his role in the searing Vietnam war drama The Deer Hunter. Through his career on screen, stage and television, Walken has shown a breathtaking range of skills portraying everything from violent villains to quirky characters in comedies. On August 5th, he can be seen starring in his latest role in the upcoming family comedy Nine Lives. 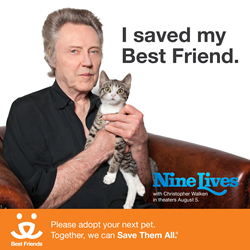 Walken plays a mysterious shopkeeper with a fondness for felines and a few tricks up his sleeve. The film is directed by Barry Sonnenfeld and also stars Kevin Spacey and Jennifer Garner. It’s actually a role he’s somewhat familiar with. At home he and his wife share their life with a shy, stray cat who showed up on their doorstep pregnant. After finding homes for her kittens, “Girl” is now a member of the Walken household. Walken joins Danny Trejo Carrie Ann Inaba Denise Richards Nils Lofgren Josef Newgarden Amanda Seyfried Cecily Strong Maggie Q Elisabeth Rohm Lisa Edelstein Tricia Helfer Emmy Rossum Michelle Beadle Jack and Suzy Welch Mike Rowe ‎, Allison Janney and Whitney Cummings among other luminaries ‎participating in Best Friends’ photo campaign featuring celebrities posed with their personal rescued dogs and/or cats in support of the Save Them All ‎call to action.